This giant short-faced animal, is an extinct species of bear belonging to the subfamily Tremarctinae. It is not only the largest bear ever known, but also the largest carnivorous land mammal ever to exist. Having lived from 800,000 to 12,500 years ago, during the ice age, Arctodus simus is believed to have evolved from Plionarctos, the oldest known genus of the subfamily Tremarctinae. The Arctodus simus inhabited North America from Alaska down to central Mexico. Fossils have been found over a very wide range (as far east as Virginia), but have been found at a much greater magnitude in the western states, especially California. Enormous specimens have been found in Alaska and Yukon. 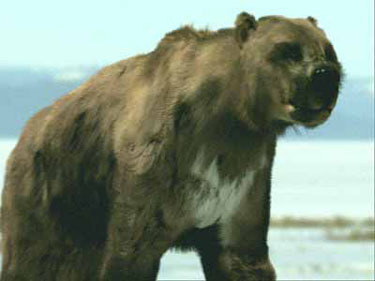 Also known as the bulldog bear or short-faced bear because of its short, broad muzzle the Arctodus simus had a low forehead with eyes set far apart and facing forward giving it excellent vision. It measured 5.5 feet at shoulder height when standing on all 4 and up to 12 feet when on its hind legs with a reach of over 14 feet. Though it weighed as much 2,000 pounds, it had a leaner build than the brown bear. It had much longer limbs than today's brown bears allowing it to run faster (over 40 miles per hour). Though the Arctodus simus might have been omnivorous, the vast majority of its diet was meat. Its longer legs would have allowed it to cover a larger territory in search of prey and carrion. It had the capability of catching and killing bison, deer, elk, muskoxen, and other large animals. However, it was probably more of a scavenger. Because of it's size, it could easily chase other predators off their kills. Its competition with smaller animals entering North America across the Bering Straight and the dying off of some of its prey both may have led toward the extinction of Arctodus about 12,000 years ago. This is also about the time that humans in North America greatly improved their hunting techniques which could have contributed to the bear's extinction both directly and by exhausting its food supply. The closest living decendent of Arctodus simus is the spectacled bear.